big windows give sneakpeeks into the breakfast/ meeting area. shake that thing lol :-)! Here is part 2 of my Fashionwise Travel Project with Martin's Patreshof (Mechelen, Belgium) ! After we explored the hotel, we changed into a fun outfit and went for drinks @ the bar. The cosy bar is situated at the main entrance of the hotel. I loved the lounging area because the furniture had this really cool retro look and was super cosy. The best part ? They serve free nachos & tapas at the bar! Need I say more ;-) We didn't even want to leave the hotel so we ended up staying at the bar the whole evening. The staff was also super friendly which made our stay even more pleasant. 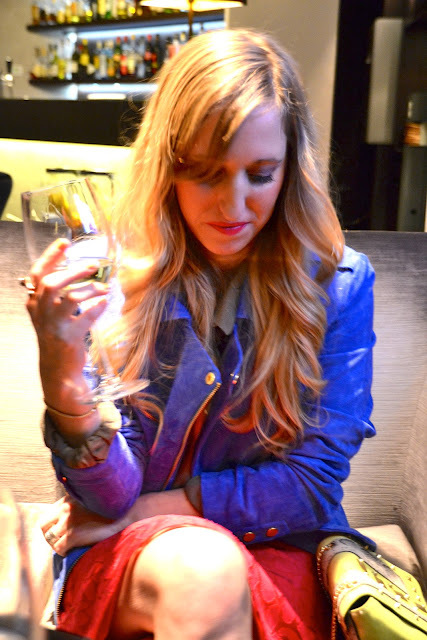 I'm wearing a Vero Moda leather jacket thanks to Sans-Online in electric Blue (totally in love with that jacket FIY ! ) a necklace from Primark, Shirt from H&m, skirt from COS, bag from H&M, shoes from Zara. If you want to recreate the curls in this look, view my tutorial here. Stay tuned for part 3 & the YouTube video !